Episode #64: Livestream - Having A Ball! WDIM Podcast did a livestream on 3/16/19 because there was a story to tell and new things to try out! This is how it happened (with some minor edits)! My undying thanks to 2 Girls On A Bench for suggesting moving the livestream to YouTube after there were some technical difficulties at the original hub! Many thanks to Frank from Work/ Life Imbalance podcast for providing his wonderful voice to the intro! Episode #66: Electric Boogaloo Too (This Time It's Personal)! Sam from Invasion Of The Remake has returned! Episode #65: Better Late Than Never Too Young To Die! Due to a neck injury, I haven't been able to record new content. Episode #63: Consider This Question! My guest is an incredible drummer! Episode #62: Leapin' Space Lizards! Sean LOVES the 80's science fiction mini-series and series V! Dan V. Copp recently wrote a book about the series (and it's 2009 counterpart)! Episode #61: Oscar Nominations and Stuff! Jamie Insalaco is back to chat about this year's Oscar nominations! Do either of us think there's any credibility to the Oscars anymore? Episode #60: Getting To Know Your Host! Episode #59: The Movies Of 2018! Jamie Insalaco is back to discuss the many movies we had the pleasure of seeing in 2018! Episode #58: ...Must Come To An End! We're back for round 2 of the COTW extravaganza! Joshneric and Ericnjosh of Creek Of The Week Podcast have returned! Episode #57: All Good Things...! Episode #57: All Good Things....! Welcome to a very special What Does It Matter? Podcast! mini-sode! I was on some shows, received some gifts, and got some voicemail! everything under the sun. Almost! with some of my favorite people! WDIM Mini-sode: My Baby Girl Tootsie! Welcome to another What Does It Matter? Podcast! mini-sode! This is a sad one, but it's absolutely necessary. WDIM Mini-sode! : Marty & Doug's New Religion! Welcome to a What Does It Matter? Podcast! mini-sode! Greg has some movies he'd like you to watch! They're a lot of fun and it's very easy for you to find them! Episode #54: Stop And Think A Second! Hilari from That's KC Podcast joins me for some real talk about real issues! As always, the usual antics come into play as well! Episode #53: Get A Grip! Fleshlight and FleshSkins Grip present.... WDIM Podcast! Long-time listener and good friend Matthew! Episode #48: Zings And Verks! Not since episode 2 of this show have we had the likes of Scott Schiaffo onboard! WDIM Rant: In Defense Of Kelly Marie Tran! Has fandom really gone this far? Kelly Marie Tran did nothing wrong! Whiny fans did! Episode #47: MCU and SPOILERS! Jamie Insalaco returns to chat the MCU! We go through the 19 movies and "rank" them to some extent. My language choices are also questioned. Episode #46: It's A New Show! Mandolin Pete returns to chat about Cobra Kai! Episode #45: Hot Coils And Best F(r)iends! Matt and Stacey are BACK! Our love for Tommy Wiseau and Greg Sestero is strong! Episode #44: What's Waiting For Tonight Starts Tomorrow! Yes.....I meant to title it that way! Episode #43: BONUS with Creek Of The Week! Episode #42: Get Out Of The Way! Mandolin Pete joins me at American-One Productions! Episode #41: Just Trying To Breathe In CA, Man! WDIM Podcast went on the road to California! Meeting friends in person is always a blast and this is no exception! Jamie Insalaco returns to discuss some movies and the 2018 Oscars! He also does some impressions that are great! Episode #39: Our favorite movies of 2017! Jamie Insalaco drops by to discuss our favorite films of 2017 and a little bit extra! Episode #38: Are We Supposed To Eat These? Episode #37: The Disaster Artist With Spoilers! This is a real professional podcast! We saw The Disaster Artist! Episode #34: Politically Correct With Pixxie Haxx! Pixxie Haxx is a very unique individual that I'm glad to have met! Hey, folks! It's time for a new episode of What Does It Matter? Podcast! Hey, Replicants! It's a new episode of What Does It Matter? Podcast! Jamie Insalaco returns to WDIM to talk Star Wars! Amongst other things that this show usually trails off to. Episode #31: Livestreaming With Wonka! Hey! Yeah! It's a new episode of What Does It Matter? Podcast! Wonka gets off of a train. He is then taken to my house to record a podcast while trying out a livestream. Episode #30: Anniversary Episode With Vorob! We're over 1 year old! It's a new episode of What Does It Matter? Podcast! We are invincible! It's a new episode of What Does It Matter? Podcast! Episode #28: Mailing Leaves with Captain Chris! Holy glitchy glitchersons! It's a new episode of What Does It Matter? Podcast! Episode #27: The Great Capeside Season 5 Prequel Sequel! Holy crazy club sandwiches! It's a new episode of What Does It Matter? Podcast! Episode #26: Like What You Want To Like! Great honk! It's a new episode of What Does It Matter? Podcast! Chris Mannix is a stand up guy! Episode #25: Will Reading Quick Reviews? Whoah! It's a new episode of What Does It Matter? Podcast! No! It's not a guy named Will reading reviews. The wit of film-maker Jamie Insalaco is quick! Episode #24: With Ronnie Parkes Of Bonfire! Yes! It's What Does It Matter? Podcast! I've spent many hours playing music with this guy! Then he just leaves to tour Europe with metal legends Bonfire! Heyyyyyyyyyyyyyyy! It's What Does It Matter? Podcast! This episode I'm joined by one of my closest friends ever! Episode #21: So.....this is...... yeah! I helm about 75% of the show. Episode #20: May The 4th Be With You! To celebrate Star Wars Day you sent in questions! Episode #19: The Fantastic 420 Birthday Spectacular! Episode #18: Bird In Flight and The Birthday Bash! Episode #17: We Have Raffle At 2:00! It's March Madness at What Does It Matter? Podcast! This is a VERY special episode! Matt & Stacey from That Movie Podcast.......But we don't discuss TMP much! Episode #16: BONUS! Musical Cues With Q The Music Show! Shiny! It's What Does It Matter? Podcast! 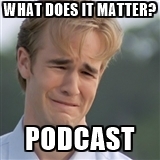 Josh and Eric from Creek Of The Week Podcast return to talk more Dawson's Creek and a LOT more! Hey! It's What Does It Matter? Podcast! WDIM listeners sent in questions! Oh boy, did we asnswer them! We even got a visit from a famous moustached actor! 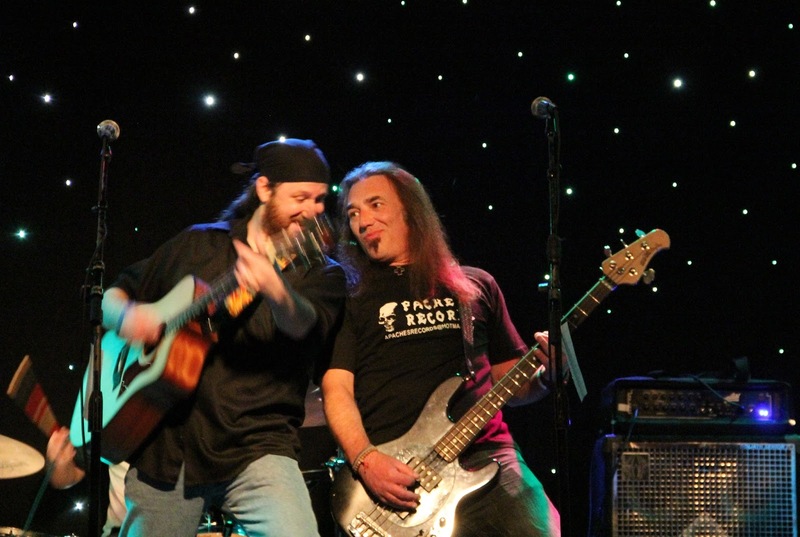 I'm joined by my good friend, songwriter, singer, drummer extraordinaire, John Mosco! Bonus Episode #11.5 with Neil From Mint 400 Records! A Bonus Episode From What Does It Matter? Podcast! I had a great chat with Neil from Mint 400 Records based out of NJ! Episode #11: Codename - Simpatico!